If you've been diving before and enjoyed it, this is what you should do next. As a PADI-certified Scuba Diver, you can dive anywhere in the world, up to 12 metres (upto 40 feet) under the supervision of a dive master or instructor. And when you're ready, you can easily upgrade to an Open Water diver certification. 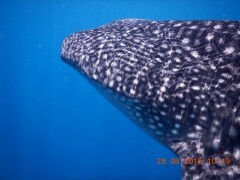 For this certification, you'll go on guided dives in small groups, to some of the most stunning dive spots in the world. 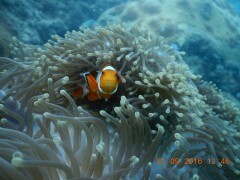 The Andamans have gorgeous reefs, teeming with colourful marine life. You'll train in 3 theory modules, as well as 3 sessions of confined water skills, and then do 2 dives in open water, up to 12 metres. This certification can be completed in 2 or 3 days. IMPORTANT: You'll need to pass a 10 minute floating test for your certification. 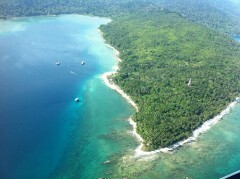 You'll be diving off Havelock Island, which is one of the best spots for scuba diving in the Andamans. The beach has teal-blue waters, soft white sand, and is fringed by lush green forests. Thanks to the clean water, high visibility, and wide diversity of marine life, this is an adventurer's paradise and attracts divers of all skill levels, from around the world. Newer and deeper sites are being discovered, and some of these locations are highly recommended, with most offering a great topography and fish life. 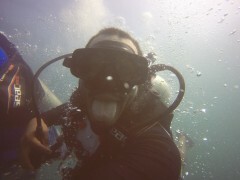 • Earn your PADI Scuba Diver certificate. 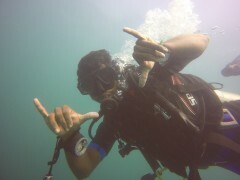 • Go scuba diving in the azure waters of the Andamans. 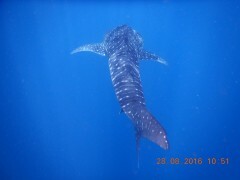 • Dive to a depth of 12 meters to see the stunning corals and fish. • Learn diving with expert dive instructors in small groups. You will receive a briefing before the dive session begins. These are strictly to be adhered to. Do not touch, break or collect coral pieces, shells, or seaweed. Do not dive alone or attempt to swim away from your group on your own. Do not consume any form of alcohol or drugs before scuba diving in the Andamans. If for any reason the student cannot complete the certification requirements, an intermediary certification or referral form will be given instead. Cancellations made 30 days or more prior to departure of the scuba diving trip in Andamans: 98% of the total amount is refunded, minus any transaction charges. Cancellations made 15 days or more before departure of the scuba diving trip in the Andamans: 50% of the total amount is refunded, minus any transaction charges. Cancellations made 0-15 days before departure of the scuba diving trip in the Andamans: No refund provided. You will receive a PADI Medical Form once your booking is confirmed, to ensure that you are fit for scuba diving in the Andamans. If you answer Yes to any of the questions, you will have to bring a signed medical certificate from a physician, without which you will not be allowed to go scuba diving in the Andamans. There is no pick-up for this trip. There is no drop-off for this trip. Eat a good breakfast, and report to the Barefoot Dive Centre on Beach 3, Havelock by 07:00 hrs. After filling in the required paperwork, you'll head out to shallow water to practise your underwater skills. When you're comfortable, you'll be taken to open wate for your dive. When your dive is over, you'll be brought back to the Dive Centre to fill in your dive log book, and then you're done for the day. Your evening is yours to spend as you please. Today you'll follow the same procedure: breakfast, report by 07:00 hrs, and head out for a fun day of diving. Today you'll practise some slightly more advanced skills before attempting your second dive. When your dive is over, you'll be brought back to the Dive Centre. Here you'll fill in some papers and receive your Scuba Diver card, certifying you as a PADI Scuba Diver. Trip ends here. • Please carry specific personal or prescribed medication only.